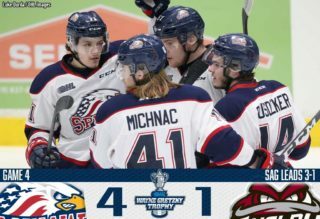 Saginaw, MI – The Saginaw Spirit remained perfect in this season’s I-75 Divide Rivalry with a decisive 5-0 victory over the Flint Firebirds at the Dow Event Center in Saginaw, Michigan Sunday evening. Saginaw rookie goaltender Tristan Lennox made 23 saves en route to his first career OHL shutout. The teams skated four-on-four after two penalties 21 seconds apart early in the first period, Jackson, Michigan native Blade Jenkins lit-the-lamp with his 15th goal of the season. After an attempted pass by 2019 NHL Draft prospect Nicholas Porco was intercepted by a Flint defender, Jenkins took the off the defenseman’s stick. The New York Islanders prospect rifled a quick snap-shot from the top of the slot that beat Firebird goaltender Emanuel Vella under the blocker. Jenkins has recorded a point in nine of the last 10 games with 16 points during the hot-streak. Saginaw leading scorer Cole Coskey had the best opportunity to extend the lead in the first period on the power play. After a nice pass from Saginaw first round pick Cole Perfetti across the Flint slot to Coskey at the backdoor, the shot just missed the net wide. Rookie Tristan Lennox, despite only six shot recorded by Flint in the first period, made big saves to keep the Spirit on top early. After Dellandrea sent a pass to Flint first round pick Evan Vierling in the front of the net, Lennox slid across to keep stop the one-timer with his pad. Lennox, a 2018 Saginaw second round pick, made his first home start of the season in the game. The Spirit added to the lead 10:24 into the second period on the power play. New York Islanders signee Bode Wilde took a wrist shot from the point that was redirected into the Firebird goal by Spirit captain Damien Giroux. It was the 16th goal of the season for the Minnesota Wild prospect, which brought him into a tie for second on the Spirit in goals. With the assist, Wilde extended his point streak to a season-high six games. During the streak, the Plymouth, Michigan native has three goals and eight assists for 11 points. Saginaw found twine for the third time just 46 seconds later with Dexter, Michigan native D.J. Busdeker’s ninth goal of the season. After Detroit Red Wings prospect Brady Gilmour’s slap shot was blocked by a Flint defender, Busdeker collected the puck in the top of the slot. The Spirit alternate captain took a turnaround wrist shot beat Vella over the blocker. The Spirit outshot the Firebirds, 35-14 through the first 40 minutes of play. With a great individual effort around two Spirit defenders early in the final frame. Flint captain Ty Dellandrea attempted a deke that Lennox denied with an extended right blocker to keep the Firebirds off the scoreboard. 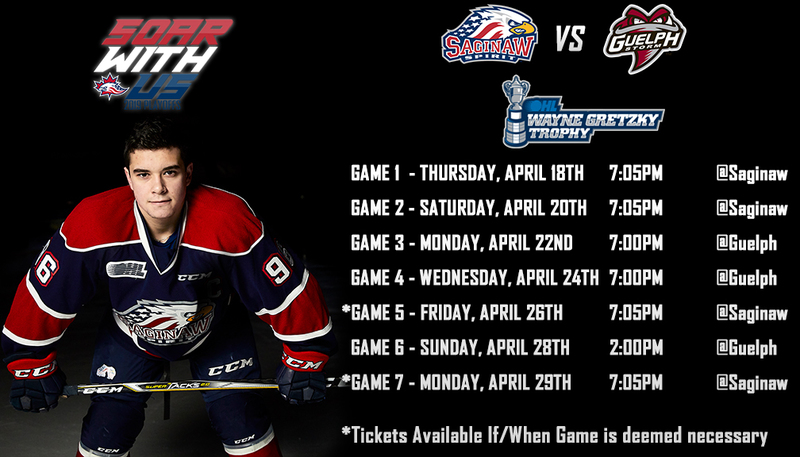 Spirit points leader Cole Coskey had a penalty shot opportunity late in the third period after a Flint defender slashed the Saginaw right-winger on a breakaway. The Zion, Illinois native took a wrist shot from the top of the slot under the Firebird goaltender’s blocker. Coskey extended his point streak to eight games with the goal on the penalty shot. Saginaw’s Jenkins capped the game with his second goal of the game with 3:14 left in regulation. The Spirit winger took a wrist shot from the left face-off dot that beat Vella under the glove. The Spirit killed all seven of the Firebirds man-power advantages in the game. 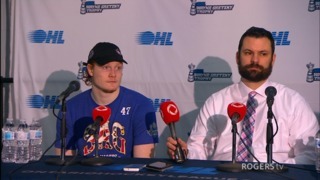 Saginaw came into the game with the 13th best penalty kill in the OHL. The Spirit logged a season-high 50 shots in the victory. 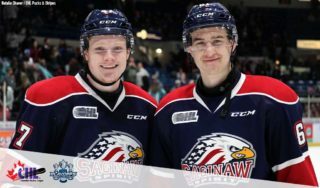 Saginaw continues the I-75 Divide Rivalry when they travel to Dort Federal Event Center to take on the Flint Firebirds for the second of a home-and-home series Wednesday, January 2. Puck drop for the in-state rivals is 7:00 p.m. with pre-game coverage beginning 15 minutes prior to puck drop. Fans can catch the action on FM Talk and Sports 100.5 and fmtalk1005.com with Joey Battaino and Dennis Desrosiers on the call. The Saginaw Spirit hosts the Kitchener Rangers Saturday, January 5, for Holy Cross Children Services Night at 7:05 p.m. Detroit Red Wings broadcasters Ken Kal and Ken Daniels will be appearing in the Budweiser Red Room before the game starting at 5:30 p.m. Lucky fans will receive a Saginaw Spirit player poster presented by Jets Pizza.